Supporting groups in harnessing their collective knowledge, Cultivate! facilitates strategy meetings, conferences and learning processes. We use and re-interpret interactive tools and methodologies, drawing from approaches such as storytelling, open space, appreciative inquiry, embodied learning, World Café, Theory U, sociocracy and mediation. The group´s goal, and the context, composition and resources of the group guide the process, and we design activities that stimulate creativity. We believe that having fun is the best way to generate ideas and to explore new ways of thinking and doing. Our facilitators can work in English, Spanish, Portuguese and Dutch. Bringing together NGO staff from Guatemala, Honduras, Ecuador, Senegal, Mali, Burkina Faso, Ghana, Nepal and the US, Cultivate! facilitated the 5-day annual Global Conference of the network of Groundswell International in November 2017. 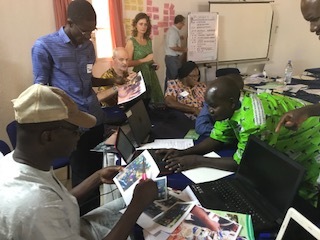 In Thiès, Senegal, the group worked in dynamic constellations, often breaking up in regional, language or thematic groups to draw out insights from the past two years and make strategic plans for the next two. We created safe spaces for participants to explore sometimes difficult questions, as well as the complexity and diversity of the context in which they work. Using heads, hands and heart, discussion alternated with playful situated experience, helping to harvest essential insights and commitment. In May 2016, members of Cultivate! facilitated a four-day Learning Exchange, organised by the Agroecology Fund (AEF) and the Alliance for Food Sovereignty in Africa (AFSA). Over 70 people from six continents met for four days on an agroecological training centre near Masaka, in central Uganda. 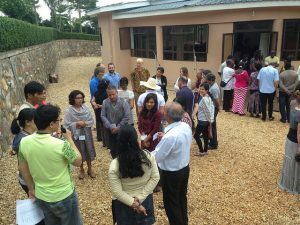 The Learning Exchange aimed to share lessons on what people are doing to promote agroecology in Africa, the Americas, Asia and Europe, and to identify better ways of amplifying agroecology across the world. It also aimed to facilitate networking and collaboration. Janneke and Jessica co-designed the Learning Exchange together with the AgroEcology Fund in a way that stimulated participation and interaction. We used creative methodologies such as open space sessions, poster presentations, small group reflections and theatre skits, and used indoor and outdoor spaces. There was ample space for participants to make process suggestions. The event generated a range of insights on how to amplify agroecology. We also documented the outcomes in a report (also available in Spanish).